Big Bike Parts® takes designing motorcycle covers seriously, as with all their parts and accessories, they believe in designing the best parts possible. If you build quality, you get quality, and it holds up better than anything else. With 30 years of making motorcycle covers, Big Bike Parts® through its UltraGard® cover brand has risen to the top of its field. So with the all new Honda Goldwing for 2018, an off the shelf existing cover would not be the best solution for this all new scaled down Goldwing. UltraGard® has designed this all new custom fitted cover for this all new Goldwing to insure the best quality fit possible with the new GT-Touring cover. 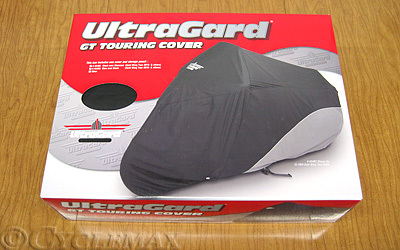 Part of UltraGard® Classic Series, this cover includes all the quality benefits UltraGard® is known for: custom fit, reflective piping and logo, elastic hem for a snug fit, tie down points to minimize wind flapping, water resistant coating polyurethane coating, windshield liner, heatshield, CB antenna access panel, rear centering tag to assist in quicker installation, and a zippered storage pouch. The design is also freshened up, to give this quality cover the best looks.